Even though Saabs latest advertising campaign is clearly for one of their evil vehicles, they do have a point with their slogan about 'why drive when you can pilot a Saab?'. Well, what with their aviation history I kinda thought this was a good point. The result being I converted my own Saab 90 into a kind of anti-gravity-hover-Saab. The picture clearly illustrates how the wheels have been removed and replaced with a 'Positronic Warp Bubble Field' enabling the vehicle to rise to an altitude of some 300 feet. Overall, the conversion has been very successful as I have simply 'floated' over a number of traffic jams/incidents. 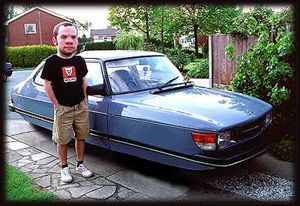 If you wish to make your Saab float I have provided the blueprints I used to enable my car to levitate. Basically the procedure is simple, requiring only basic tools (screw-driver, ruler, duct-tape, centre punch and sun dial). The trickiest part is the installation of the 'Positronic Warp Bubble Field' which has to be done in an absolute vacuum. I used masking tape (around door edges) and a domestic hoover to create the required conditions in my garage. NB - Be sure to wear breathing apparatus whilst in total vacuum.